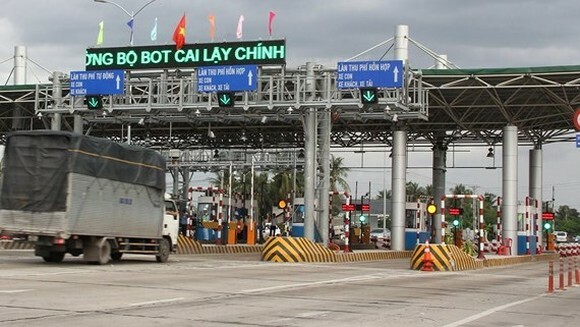 The controversial tollbooth Cai Lay BOT (Build-Operate-Transfer) has resumed operation since 9 a.m. today after three month halt in the Mekong Delta province of Tien Giang, announced National Highway 1A Tien Giang Investment Company. The company has arranged 100 toll collection staff and two new areas one for drivers to pay toll with small change and one for press operations. Tien Giang province has mobilized authorized forces to ensure security, traffic safety and prevent traffic jam from occurring. The station has reduced the fee by 30 percent for all vehicles. The lowest price is VND25,000 for automobiles of less than 12 seater and trucks of less than two tons. The highest price is VND140,000 for trucks of from 18 tons and heavier and over 400 foot container lorries. The new toll levels are similar to that in adjacent tollbooths in Soc Trang and Bac Lieu bypass roads of National Highway 1A. In addition, drivers with household register books in areas near the tollbooth will enjoy toll reduction and exemption. Specifically, vehicles of types 1 and 2 not trading transport services of those with household books in Phu Thuan, My Thanh Nam, Binh Phu and And Phu communes of Cai Lay district will be exempt from paying the fee. They will enjoy 50 percent cut for trading transport services. Buses will receive a similar reduction. On August 1, Cai Lay BOT station officially came into operation. Still drivers raised objections by paying toll with small change causing traffic jam, saying toll levels unreasonable. The investor then decided to stop operation of the station since August 15.